On November 3rd, 2011, on our second to last day of an unforgettable holiday in South Africa, we visited Dorise Hettlich in her home away from home near Cape Town. 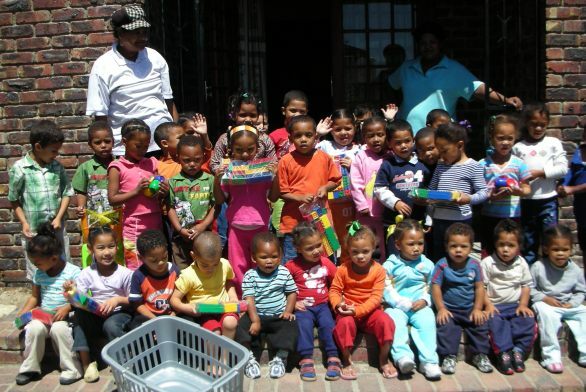 When we visited the Kindergarten "Frank's Heaven", we could see with our own eyes, what positive impact many little deeds were having on the quality of life for the underprivileged children in the Kylemore community. 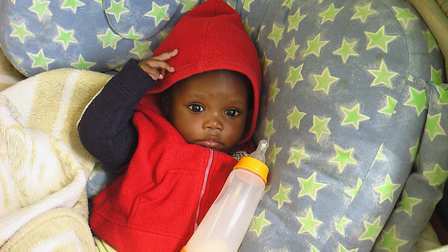 Among others, HIV-orphans, undernourished and abused kids are finding a safe haven at "Frank's Heaven". With her typical enthusiasm and boundless energy and with the help from her family and friends, Dorise Hettlich created a place in Kylemore for about 125 children - ranging from infants to pre-schoolers - who are now receiving a hot meal every day and plenty of care, support and creative stimulation. To build a house for a Kindergarten is one thing; the other - which cannot be given enough credit - is the challenging task to maintain it in the future. Only with longterm support can the quality of life of these poor little ones be improved, with the great hope that maybe the vicious cycle of poverty, alcohol and drug abuse, and AIDS that their parents are suffering from, can be overcome in their future. It is incredible with how much commitment and energy so many people together with Dorise Hettlich continue to commit to this project. They assure that enough food for 125 mouths is provided every day to cook at least one proper meal - the only one for many of the children. And providing food is only a small part of what is needed to continue providing a better future for the kids. During our visit, we witnessed the unbelievable joy of the older children who were soon going to start school, when they were given a small backpack to be used as a school bag. They could only dream of these seemingly basic items if "Frank's Heaven" and the Hettlich Family were not in their lives. We also realized how many children desperately need a place like "Frank's Heaven" but will likely never get one. 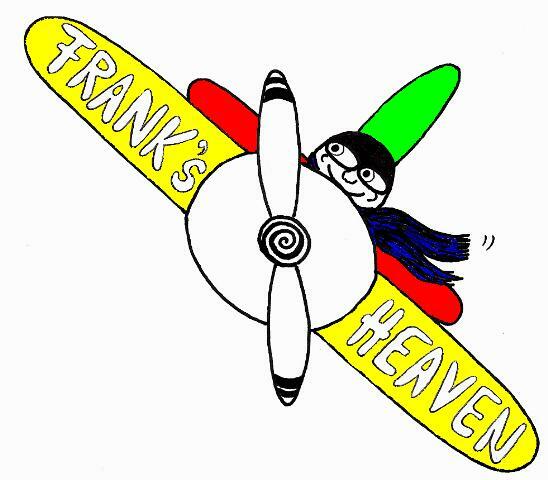 This sober reality makes "Frank's Heaven" all the more special - true to the above proverb: the sad face of the earth was transformed to one of hope for at least these 125 children! We are so impressed and will continue to support this wonderful project. We encourage readers to join the cause - what people are achieving in Kylemore can be supported from anywhere in the world. Then the saying by the Xhosa will also be true for little people in Kleve, Germany, doing little deeds in Kylemore, South Africa - changing the face of the world for so many children. Just to thank you and the entire Hettlich family so very much for your very generous contribution of 1 500 Euro for the construction of a website for Imbali Western Cape, and more specifically for our “SUNNY SKY PROJECT” which is the banner that will embrace all the upliftment programs that brighten the outlook of the world we share with the children of Kylemore. 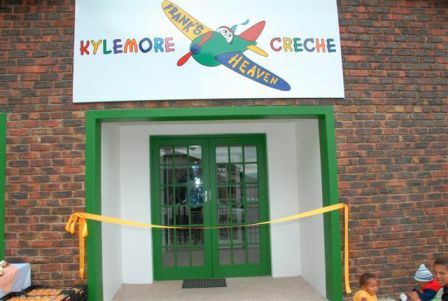 Kylemore is a previously disadvantaged rural community outside Stellenbosch in South Africa – although an old established community it is still economically vulnerable with 60% of adults unemployed. The village is deprived of community facilities! 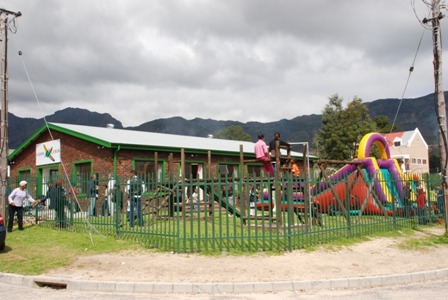 Social structure is limited to a primary school, a high school, churches, a municipal clinic and “Frank’s Heaven” a crèche established by Imbali with the generous support from the Hettlich Family in 2006/7. This is where 120 underprivileged children between the ages of 0 to 5 years find safe care and where they are daily treated to soup and a free fortified muffin [sponsored by Lebenslinien-ev.de] and baked in the children’s “Magic Muffin” bakery that has been established by Imbali in the Kylemore High School. Despite the deprivation and economic hopelessness, the largely Christian community are devout churchgoers. Nevertheless, drugs and alcohol are a constant concern and inevitably many children require nutrition, all need recreational and educational upliftment opportunities to improve the quality of childhood, and general chances for success in life. 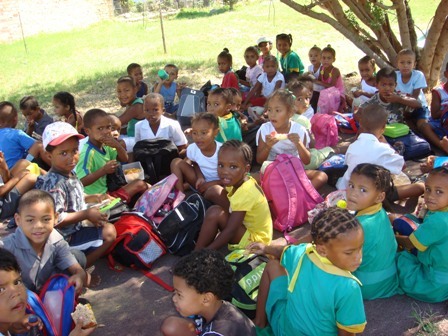 As Imbali we have initiated and established a number of on-going projects in this community, mainly benefiting children. Our dream is to find the funds [6 000 Euro per annum] for a qualified educare teacher to take responsibility for the educational upliftment of a further 60 pre-school children into a safe and happy environment – children between the ages of 5 – 6 years old who will be cared for after school closes and until parents can fetch them after work. The building is in place and the space reasonably equipped. Thank you again dear Dorise because the establishment of this website will give Imbali the reach required to give nurture, to create hope and to generate opportunity to improve the quality of childhood for all these young children in Kylemore. Bless you, Bianca, Malaika, Claudia and Robin for caring! Jeanne and the Kylemore Kids! 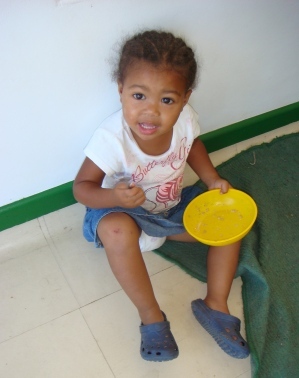 Pre-school children between the ages of 5 to 6 years need to come into safe care in the afternoon. One small undernourished little girl enjoyed her soup! We invite you to join the Hettlich Family and Imbali in their vibrant support of the children of Kylemore – where human dignity, self respect, personal contribution and community esteem will, with their relentless support, one day be the norm. Please let us introduce to you a small town near Cape Town, South Africa. Kylemore and its ~4,000 inhabitants lies along the 'winery route'. The unemployment rate has reached 60% and is causing terrible problems, especially for the children. Drugs and alcohol are widely used and there is little hope for the future for most. 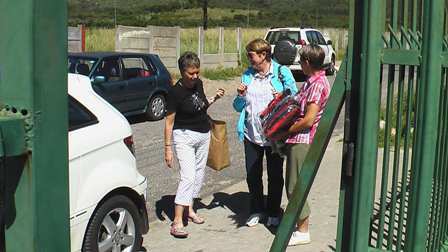 The Hettlichs have come to love South Africa and are actively trying to help for the last 10 years. The target group are children. We would like to provide them with a new outlook on life, a life with the knowledge that they in turn will be able to care for their own families. Es lag Dorise und Frank immer am Herzen, Krankenhäuser, sowie Schul- und Kinderheimprojekte in Afrika zu unterstützen. Bisher sind schon viele Ziele realisiert worden. Das zuletzt geplante Projekt war die Gründung eines Kindergartens für unterpriviligierte Kinder im Aussenbereich von Stellenbosch (bei Kapstadt), Südafrika. Die 50-60 Kinder kommen aus Haushalten, in denen Arbeitslosigkeit und Armut vorherrschen. Gerade in einem Land wie Südafrika ist es sehr wichtig, den Kindern von klein auf Aufmerksamkeit und Geborgenheit zu geben, sowie eine neue Auffassung von Zugehörigkeit und Stolz zu vermitteln - nur so können die enormen Alkohol- und Drogenprobleme bekämpft werden. Der Kindergarten wird auch für viele Kinder der einzige Ort sein, wo sie regelmässig Mahlzeiten bekommen werden. 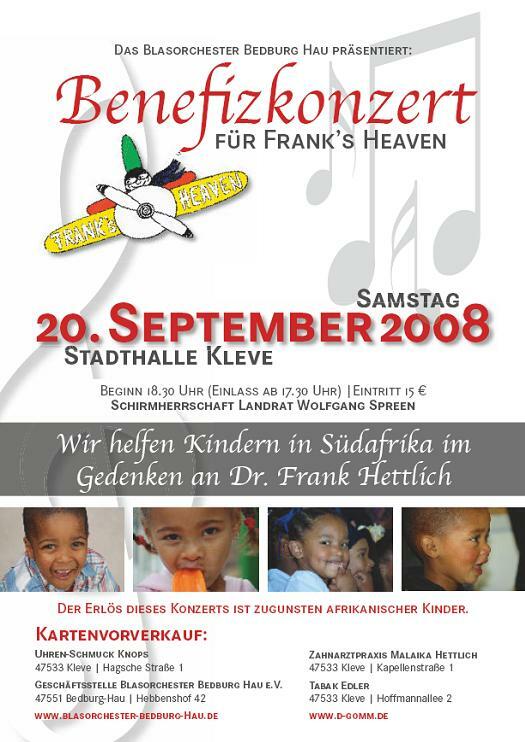 Wir werden nun Franks Vorstellungen und Pläne verwirklichen und in diesem Sommer mit dem Bau von „Frank's Heaven" beginnen. Das Projekt ist mit ungefähr EUR 50.000,00 angerechnet und Spenden sind herzlich willkommen. Der jetzt bestehende Kindergarten ist in einem unzumutbaren Zustand. Ratten hausen unter den Dielenbrettern und Tauben nisten unter dem Dach, von wo sie ihre Exkremente in das einzige Spielzimmer, die Toiletten und die Küche abwerfen. 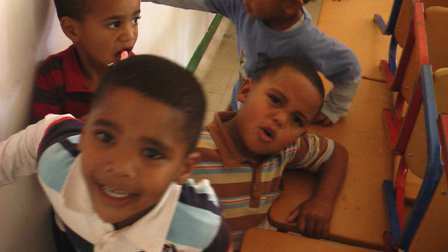 Account about the opening of the Kindergarten in South Africa on September 8th 2007. 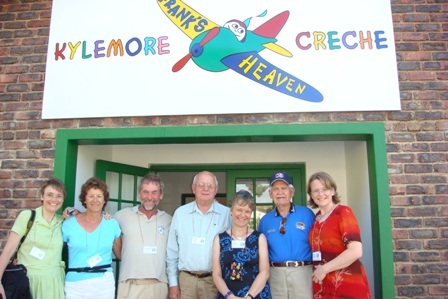 "Frank's Heaven" – Kylmore Creche, Kylmore, South Africa. Finally it was ready - on September 8th - with the whole town celebrating - the Kindergarten was officially opened. Each day all the children in "Frank's Heaven" receive a fortified muffin -- the muffin has ingredients that addresses the 'hidden hunger' in the malnourished child. The recipe has been developed by SASKO MILLING & BAKING, one of South Africa's biggest milling companies, in liaison with the South African Medical Research Council. In the little village of Kylemore a small bakery has been installed in 4 rooms in the High School where 3,000 muffins are baked daily. Of these 2, 500 are sold for as little as R1.50 to children at the high school and 500 find their way free of charge to the poorest of the poor children in the village. Frank's Heaven receives a free muffin for every little child because the sponsors of the free muffin believe that proper nourishment of these little children at this early age will give them a better chance in life. Today it was banana muffins -- tomorrow it might be chocolate or vanilla or blue-berrymuffins -- the flavours that the children love. The children look forward to this little treat after they have had their sleep in the afternooon and before they are fetched from their creche by their parents or a sibling and taken to their homes. Do you want to support this project?! Please see 'Charity/Donations' for information.